AP Schools,Posts,Staff(Teachers) Rationalization Norms/Guidelines: AP School Posts, Staff, Teachers rationalization norms and guidelines, AP GO.No.29 AP Teachers, AP Schools staff rationalization norms, AP Primary, UP, High schools rationalization guidelines and norms, AP Schools and Teachers rationalization guidelines, One class-One teacher. 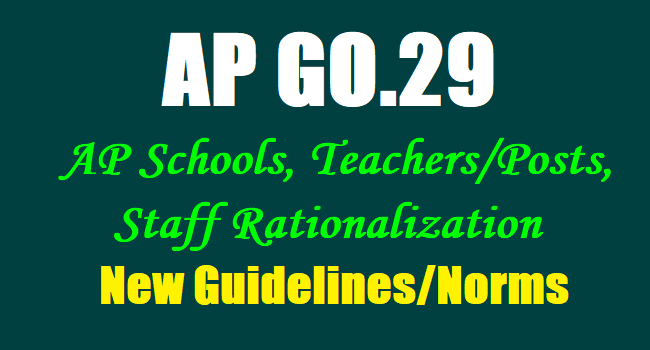 AP GO.29 ~ AP Schools, Posts, Staff(Teachers) Rationalization Norms/Guidelines: Norms for Rationalisation of Schools, Posts and Staff under various managements (viz.) Government, Zilla Parishad, Mandal Parishad Schools in AP. School Education - Norms for Rationalisation of Schools, Posts and Staff under various managements (viz.) Government, Zilla Parishad, Mandal Parishad Schools – Amendment - Orders - Issued. 1. O.Ms.No.55 Education (Ser.III) Department, Dated 23.04.2011. 2. O.Ms.No.61 Education (SE-SER-III) Department, Dated 16.05.2011. 3. S.E.Lr.Rc.No.25/Estt-III/2015, Dated:30.06.2015 addressed to Government. 4. O.Ms.No.39- 51, Education (Ser.II) Department, Dated:07.08.2015 pertains to respective districts. 6. S.E.Lr.Rc.No.4102/Estt-III/2015, Dated:26.04.2016 addressed to Government. 7. Govt. MemNo.228816/Ser-II/A2/2016 School Education Department, Dated:19.05.2016. 9. Rc.No.4102/Estt-III/2015, Dated: 10.04.2017 addressed to Government. 10. O.Ms.No.29, School Education (Ser.II) Dept., dt.22.05.2017. 11. O.Ms.No.33, School Education (Ser.II) Dept., dt.04.06.2017. ORDER:- In the meeting held with the FAPTO and the JACTO members with the Hon’ble Minister for Human Resources Development on 22.06.2017 & 29.06.2017, it was agreed to continue the Upper Primary Schools (for classes VI & VII) with less than 30 and more than 20 student enrolment and to continue the Upper Primary Schools (for classes VI to VIII) with less than 40 and more than 30 student enrolment. 2. Accordingly, Government hereby order the following amendments to the annexure to G.O.Ms.N29, School Education Dept., dated 22.05.2017 in respect of Upper Primary Schools. For the Tables and guidelines under Upper Primary Schools in Annexure to G.O.Ms.No.29, School Education (Services.II) Dept., dated 22.05.2017, the following shall be substituted. (i) Minimum staff to be provided for Upper Primary Schools with 21-100 enrollment in classes VI to VII shall be 4 subject teachers. (ii) Minimum staff to be provided for Upper Primary Schools with 31-140 enrollment in Classes VI to VIII shall be 6 subject teachers. (iii) In Upper Primary Schools with enrollment slaps crossing over and above 386- 420 student enrollment, one additional School Assistant post for every 35 additional enrollment of students may be provided in the order of SA (Maths), SA (English), SA (First Language), SA (SS), SA (BS) and SA (PS). (iv) The Upper Primary Schools VI & VII and VI to VIII Classes with <20 and <30 enrolment respectively may be downgraded as Primary Schools. The students may be accommodated in the nearby High Schools / U.P. Schools within 3 KM radius. Government of Andhra Pradesh; School Education - Norms for Rationalisation of Schools, Posts and Staff under various managements (viz.) Government, Zilla Parishad, Mandal Parishad Schools – Orders - Issued. Government vide G.O.Ms.No.55 Education (Ser.III) Department, Dated:23.04.2011 and G.O.Ms.No.61 Education (SE-SER-III) Department, Dated: 16.05.2011 have issued norms for Rationalization of Schools, Posts, and Staff under various managements (viz.) Government, Zilla Parishad, Mandal Parishad, Municipal Schools. It is found that, there are still some schools with higher student strength vis- à-vis the sanctioned teaching posts and on the other hand there are some schools with uneconomic strength of students having more teachers. 11) This order issues with the concurrence of the Finance Department vide their U.O.No.FIN-30022/7/2017-SO(HR.I), dated 19.05.2017. Allocation of Teachers to Primary Schools shall be on the basis of norms indicated in Table-1. (b) If the enrolment in English Medium in Success Schools is >50 to <140, 4 Teachers (i.e.1 S.A. (Maths), 1 S.A (P.S), 1 S.A (B.S) and 1 S.A. (SS)) shall be provided, in addition to the staffing pattern defined in Table III-A. School Education - Norms for Rationalization of Schools, Posts and Staff under various managements (viz.) Government, Zilla Parishad, Mandal Parishad Schools – Further Orders - Issued. 1.G.O.Ms.No.55, Education (Ser.III) Dept., Dt.23.04.2011. 2.G.O.Ms.No.61, Education (SE-SER-III) Dept., Dt.16.05.2011. 4.G.O.Ms.No.39-51, Education (Ser.II) Dept., Dt.07.08.2015. 10.G.O.Ms.No.29, School Education (Ser.II) Dept., dt.22.05.2017. ORDER: Whereas, orders have been issued in the reference 10th read above, regarding norms for rationalization of schools, posts and staff under various managements such as Government / Zilla Praja Parishad / Mandala Praja Parishad, wherein, among others it is ordered that the Primary Schools with <20 student enrolment may be considered as Non–viable and consolidated with nearby existing school within 1km radius. 2. And whereas, the matter has been reviewed and after careful consideration of the circumstances, Government have decided and hereby ordered that the Primary Schools with <20 student enrolment shall be continued for one academic year i.e. 2017-18 and the Primary Schools with <10 enrolment of students shall be considered as Non-viable and consolidated with nearby existing school within 1km radius. If a school fails to enhance its student enrolment to 20 and above during that academic year i.e. 2017-18, it shall deemed to be consolidated before the commencement of ensuing academic year i.e. 2018-19 with nearby existing school in accordance with other norms. 3. All other conditions including transportation allowance / transportation would remain in place and would be adhered to without fail. The Commissioner of School Education would ensure that schools rendered single teacher would be made into double teacher in accordance with RTE by work adjustments and if needed by deploying academic instructors after obtaining approval from the Government, so that all schools are run properly. 4. The Commissioner of School Education, A.P, Amaravati is authorized to consolidate in the next year the primary schools which failed to enhance their student enrolment to 20 and above before commencement of next academic year i.e. 2018-19.